L: 18" x H: 42"
Bistro Wall Art Make your space reminiscent of a French café with this Bistro wall art. Great for dining room spaces or eat-in kitchens, this wall art will be a great finishing touch! Plus, it comes with sawtooth hooks for easy hanging. 5-10 days. Please allow for standard ground transit timelines. Make your space reminiscent of a French café with this Bistro wall art. Great for dining room spaces or eat-in kitchens, this wall art will be a great finishing touch! Plus, it comes with sawtooth hooks for easy hanging. 5-10 days. In-store pickup is not available. Delivery options for other products may differ. 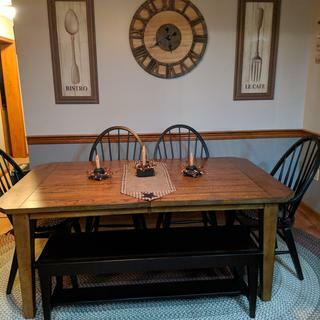 I needed something for my Kitchen Wall.....this was perfect...I bought it along with the matching fork picture...looks awesome. These works of art totally brought life to my home!! LOVE my new pictures! Love Raymour and Flannigan for my decorating and furniture. Thank you.